A couple of weeks ago I came on a new sidewalk on Prospect Ave. that seemed to be out of compliance with local ordinances. 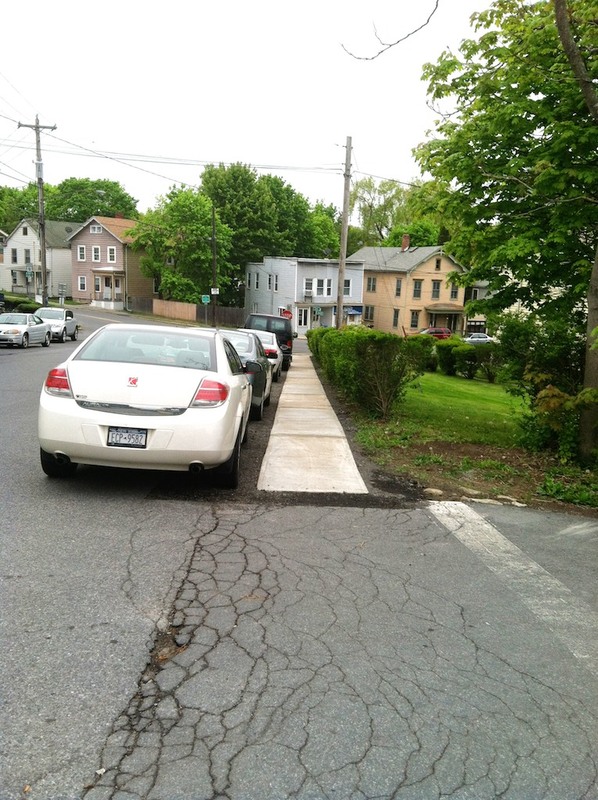 At the time I wrote a bit about this, “Sidewalks in Hudson – Dangerous for Lack of Code Enforcement and Common Sense“. Yesterday, my walk took me up Prospect again. Now we seem to be seeing the finished product. Not only is it not as wide by 16 inches as the ordinance calls for, there is no curb. Perhaps our Code Enforcement Officer Mr.Wurster could shed some light on this state of affairs? Or perhaps it is to the Superintendent of Public Works Mr. Perry that we should address a question. It is not clear in the city Code about who is responsible for overseeing sidewalk construction.